Ever stood in the frozen food aisle and looked at the yummy images on the cartons of frozen dinners? Ever wondered how the dish inside could possibly be that appetizing? The folks at Food in Real Life have tackled that question, sacrificing their taste buds to get behind the box cover. Food in Real Life aims at the manufactured images used to sell mass-produced food, and arms the wary shopper with an inside view of their potential dinner. 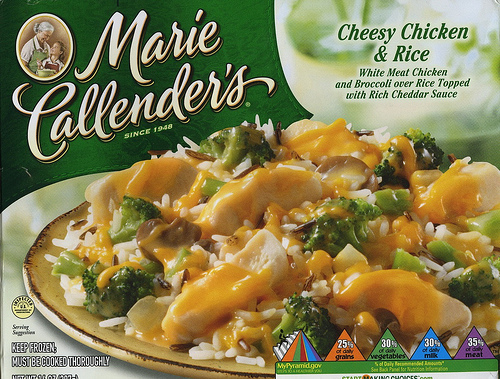 For example, here's the carefully crafted image on the outside of Marie Callender's Cheesy Chicken and Rice. What you find on the inside, however, is another story.